ManGO for it! 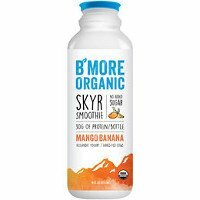 Fragrantly sweet, exotic mangoes and brazen bananas go boldly where no smoothie has gone before - swirled into our creamy skyr, creating a mouth-watering flavor blast fueled with nutrition to keep you going! It does an island dance on your palate and nourishes your body with healthy probiotics, a third of your daily protein and no added sugar.